DC comics | Star Car Central - Famous Movie & TV car news! A new Batmobile in London? He is the iconic Caped Crusader who has starred in comic books, television series and film franchises for the last 70 years. Now Batman is making his stage debut in one of the most lavish theatrical productions ever to appear in London, at The O2 arena. Gotham City will be brought to life in Batman Live, with a huge stage lit up by a dazzling display of pyrotechnics and special effects. The Dark Knight will be helped by a brand new Batmobile created by Formula One designer Professor Gordon Murray, which will drive on to the stage before skidding to a halt. A 100ft screen shaped like a bat will act as a backdrop for the special effects, and characters will be able to fly around the set thanks to a grid suspended above the stage. It will also include an action sequence where the Joker tries to escape in a hot air balloon, only to be shot down in flames. It will tour the world for five years! 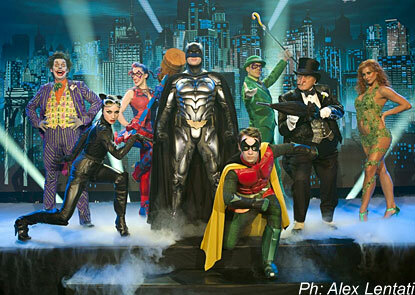 For more details go to batmanlive.com. But batman the musical idea has been around a while, and even was featured in one of the Batman:The animated series episodes! Take a look! One of my favorite clips! 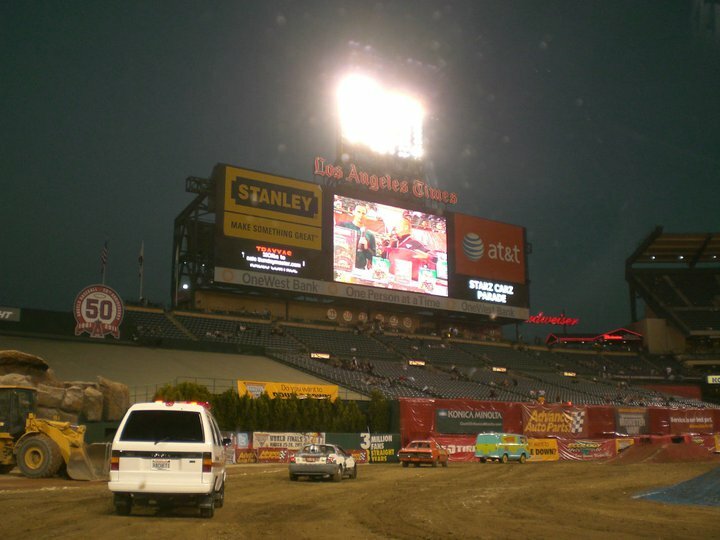 STARCARCENTRAL.COM BACK AT MONSTER JAM FOR TWO WEEKENDS! Thanks to Monster Jam Fan Charger Steve, it’s now been three years that Nate Truman’s star car central gang and Steve’s San Diego star car owners have appeared with the monster truck drivers at Monster Jam events! Both in San Diego and Anaheim, and this year for the first time at Dodger Stadium! Monster Jam 2011 Charger Steve leads the way around Anaheim Stadium with Nate Truman's StarCarCentral movie cars. STEPHEN BOGGS JURASSIC PARK MONSTER TRUCK! Your ticket to Monster Jam includes entry into the drivers area where the star cars will be on display! Come say you are a fan of the blog and meet the owners – and get a photo with your favorite movie or TV car! Pray for no rain on Saturday and we will see you at DODGER STADIUM at 2:00 pm! Then stay for the show, we will take a lap inside the stadium as part of the pre-show around 5-6 pm! Cheer on your favorite car! NITRO BURNING FLAME THROWING CRASHES!!! And that’s just you trying to get into the parking lot! Come say “HI” and we will see you there! For fans of FACEBOOK, Starcarcentral.com International now has it’s own page to see all the photos from members at the event! Can you design the next batmobile urban assault vehicle? Here’s a challenge for all the builders that want a chance to design something along the lines of a functional batmobile, or futuristic version of today’s HUMMER. 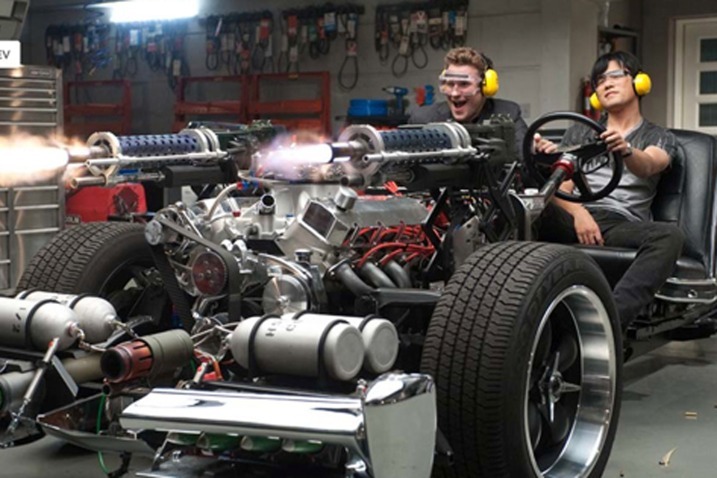 If you ever wanted to design a super car loaded with as many weapons and tools as you could imagine (think your own personal Batmobile), now is finally your chance. Not only do you get an opportunity to design the craziest vehicle you can dream up and see it built in real life, but you can also win up to $7,500 in prize money from the Pentagon’s research branch, DARPA. The vehicle has to use “tubular steel chassis with existing GM LS3 V8 powertrain,” which is the steel frame pictured below. Has to carry up to five passengers, including up to three people lying down. As long as you follow the three rules above, you can get as creative as you want with your design. Thinking of stealing some ideas from the Transformers movie? How about jet propulsion and speedboat ability? Go for it. DARPA is open to all suggestions. Submissions are to be in before March 3, 2011. To find out more information and submit your designs, click here. I have a chassy ready to go, but I don’t think it will seat 5 people even if they are lying down! Batmobile History through the years! My netpal Bill has done a great service to all the batfans, he has documented and collected everything ever built or called a “Batmobile” in the comics, movies and TV and put them in order! I want to thank Bill so below is his home page write up of his quest! Years ago Bill gave me credit years ago for some info on the 66 batmobile and I managed to send him a few batmobiles he didn’t know about yet, I don’t think that’s possible now!! So if you think you can send him something he DOESN’T know about the batmobile, check out his site or read his write up below about why he did it! Batman first appeared in May of 1939 in Detective Comics #27, and although the first true Batmobile did not appear for another two years, it has become one of the Dark Knight’s best known weapons. The Batmobile made its career debut in Batman #5, then appeared on a comic cover for the first time for Batman #20. Because of different artists’ interpretations of what the car should be, it changed size, shape, and features frequently. Later, as the car was marketed beyond the comics, more forms appeared based on practical or aesthetic considerations. In the 1960s, the first full size, fully operational Batmobile was built for the TV show Batman, and had to face financial and functional questions. 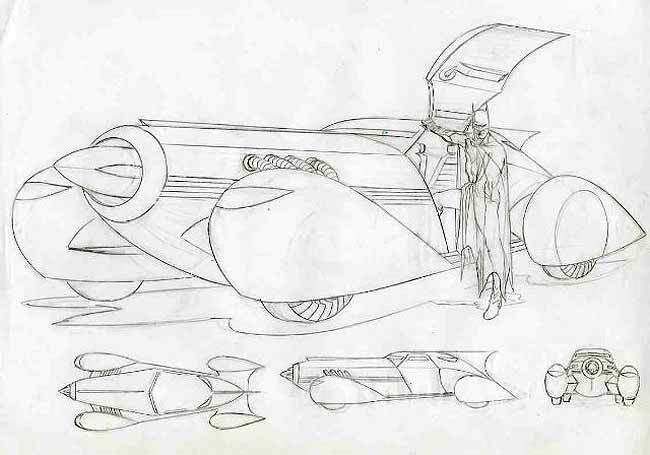 A few years later the design of this car would be modified for use in the Superfriends cartoon series, with the unique considerations of making a car that could be easily drawn repeatedly for animation. Then, nearly three decades after the TV series, Batman returned to live action with Warner Brothers Batman movies. At about the same time, Batman: The Animated series came out, with a whole new take on the design of Batman and his universe. All of this was on top of the natural evolution of the car over 60+ years, taking into account new technological features like the jet engine and the computer. Actually, we had 14, but two of the new Bullit Mustangs had to leave before the photo shoot! Lou, our “Starsky and Hutch” Torino owner, is mainly responsible for the success of this event, because he offered his house and a great BBQ meal to lure the star cars out of their garages. We started the day with a car show that benefited the Girls Basketball team, and it was worth it (even worth the bad sunburn I got and am still recovering from) because not only did we have a great turn out of Star Cars, but we found four more at the show with a few leads to new members! A great photo, great friends and stories, not too hot of a car show, and lots of new members and leads on new star cars, it couldn’t have been better! Cars now in our sights, Dave said he knew of another Smokey and the bandit, Jason found a Dragula and the Joe Dirt car and we are tracking those down, and Mark (Adam-12) is working on a Squad 51 Emergency! truck! 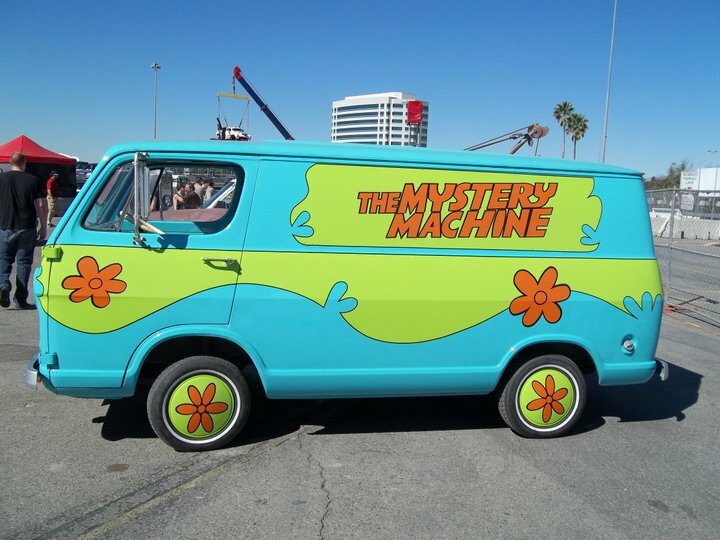 We still have another 5 cars in the wings, that we will have to add to our next big get together, the black Beauty from the Green hornet, the Blues Brother’s police car (Blake was working at Universal…) The General Lee, tango and cash truck, Seans Ghostbusters, Scooby Doo van (next time, Joe!) 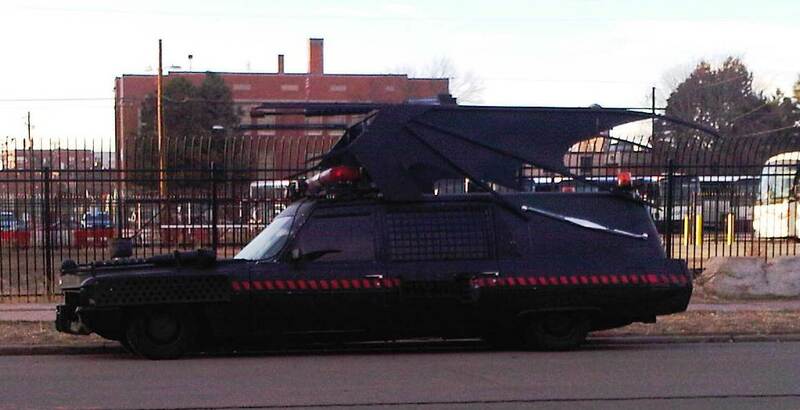 , Jason’s KITT from Knight Rider, Mad Max (we missed you Paul!) Gary’s Highway Patrol, Martin’s Christine, Duke’s Mustang… that’s my new goal, to get all of those guys for an even bigger toy collection!